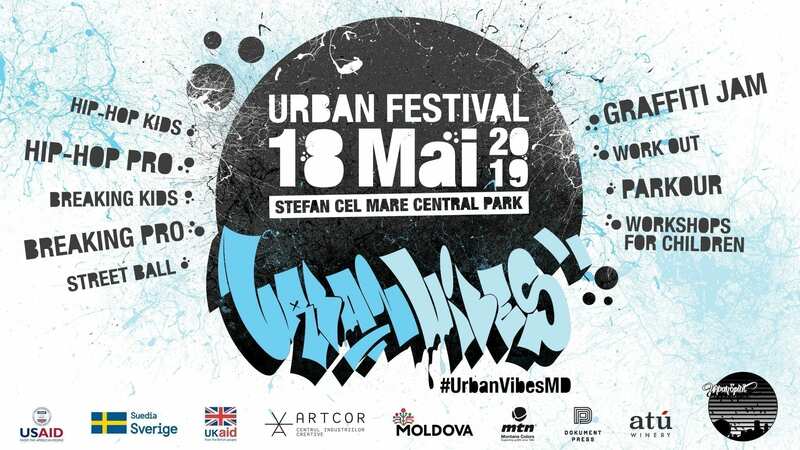 For the third year in a row, the festival “Urban Vibes” is ready to whirl on one platform the energy of the most different representatives of urban culture and unite people who take their skills and inspiration from the streets! The festival program includes competitions on hip-hop, breaking, parkour, workout, streetball, distribution of hot sound from our DJs and MC, as well as graffiti jam from the brightest representatives of both foreign and local scenes. The event is organized by Urban Spirit – Moldova , under the auspices of “Pomul Vieții”, with the support of USAID Moldova, Embassy of Sweden in Chisinau, UKAID, Artcor, ATU Winery, Dokument Press, Montana Colors, Moldcell, Swiss Energy Vitamins Moldova, aqua unIQa, Azur-ART, Barbar, betty ice, Red Bull, Sporter.md, as well as our people PlatformaUrbana and NP “Foundation for the Development of Creative Collectives”, which helps us to unite children and youth of the two banks of the Dniester river into one common culture and erase the boundaries between us! Вот уже третий год подряд фестиваль “Urban Vibes” готов закружить на одной площадке энергию самых разных представителей урбан культуры и объединить людей, которые несут своё мастерство и вдохновение с улиц! В программе фестиваля соревнования по хип-хопу, брейкингу, паркуру, воркауту, стритболу, раздача жаркого звука от наших Диджеев и MC, а так же граффити джем от самых ярких представителей как зарубежной, так и локальной сцены. Мероприятие организовывает Urban Spirit – Moldova ,под эгидой “Pomul Vieții”, при поддержке USAID Moldova, Embassy of Sweden in Chisinau, UKAID, Artcor, ATU Winery, Dokument Press, Montana Colors, FEEDER.ro, Moldcell, Swiss Energy Vitamins Moldova, aqua unIQa, Azur-ART, Barbar, “Betty ICE, Red Bull, Sporter.md , а так же наших людей PlatformaUrbana и НП «Фонд развития творческих коллективов», которые помогают нам объединить детей и молодёжь двух берегов Днестра в одну общую культуру и стереть границы между нами!